When India attained Independence, there were very few industries to speak about that could provide the growth and employment that India required. The Industrial Revolution which revolutionized Europe completely bypassed India and other colonies. This translated to India being reduced to a Exporter of Raw Materials and Importer of Finished Products. With little private enterprise to support the growth of the nation as well as provide employment, the Government, after independence in 1947, decided to follow the Soviet model of investing in large industries. Over time, the size and influence of Public Sector Enterprises grew in size and number thanks to both growth in economy and lack of competition from private enterprises in areas where the private companies weren’t allowed to invest. Since 1991 when India finally started to open up its economy, we have seen the government slowly selling partial stakes in a large number of Industries it owns. 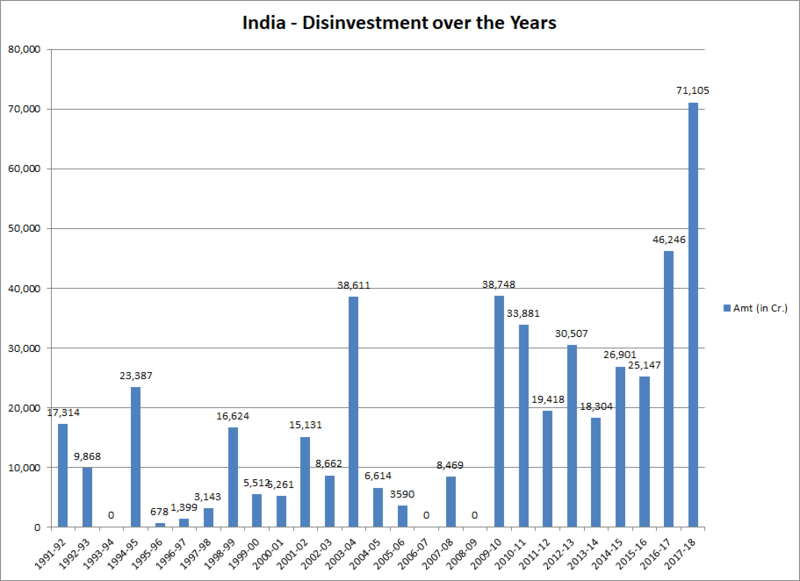 While Disinvestment started in the year 1991 – 92, it was only in 1999 – 2000 that the government of the day finally went ahead and sold a company, Lock Stock and Barrel. Modern Food Industries (India) Limited (MFIL) was the company that got sold to Hindustan Lever Limited (HLL) for Rs 1.05 billion marking the coming of age of Privatization. The era of Strategic sales was short lived though. Strategic Sales ended after the election of 2004 where in NDA lost the poll. The Left came in to power (partially) and they hate the idea of privatizing anything. The only one instance where the government did go with a strategic sale post 2004 was in selling their remaining quantity of shares in Maruti Suzuki Ltd. The initial bunch of sales were through Auction route with most of the stocks being taken up by Institutions. While most of the sales have been through Offer for Sale, in recent times, and the Government has used Buyback and sales to Exchange Traded Funds as mediums through which it could reduce its equity. In the times when there was a dearth of Private capital, it made immense sense for the government to invest into businesses. But as the economy opened up and private capital made its mark, it is no longer disputed that the government isn’t and shouldn’t be running business, especially since it also being the law maker can distort the market. From Airtel in Telecommunications to Zee Entertainment in Media, Private Enterprises have succeeded beyond anyone’s imagination. Public Sector Banks which were once the main stay of the economy are slowly but surely losing out on their market share as private sector banks come of age. Unfortunately, the socialist mindset that has ingrained the country has meant that there has been very slow progress is pushing the government of the day to get out of funding industries that are better served by private investors and instead concentrate the same energies on social improvement. Public Sector Banks despite their head start and expertise have turned out to be one of the worst allocators of capital with every year asking for tens of hundreds of crores of budgetary support. The recent rise in Non Performing Assets meant that even these amounts were too piddly to help, and pushed the government to announce a large capital allocation over two years. Air India, once the King of the Air is now reduced to asking for handouts from the government to survive as fierce competition from other private players have snatched its food right under its nose. 2017 – 2018 has turned to be the year with the highest amount appropriated through disinvestment. But the acquisition of HPCL by ONGC defeats the very purpose of Disinvestment. Of course, the acquisition of HPCL by ONGC wasn’t the first such instance. In 2001-02, IBP was acquired by IOC. Going back, in 1998 – 99, IOC, ONGC and GAIL cross purchased stakes of each other. Disinvestment of Public Enterprises isn’t something that is unique to India. What is unique though is that nearly 18 years since we started on this journey, the government continues to run businesses on a pretty large scale. Internationally, the speed has been much faster. During the era of Margret Thatcher, the UK government over a period of 11 years privatized 670 PSUs netting the government a inflow of US$ 5.3 billion. In Germany, the government got rid of 13,500 PSU’s over a period of just two years. Of course, things can go wrong as was seen in Russia where such a rapid sale of assets meant a cornering of valuable assets at knock off prices resulting in development of a power center of their own. For too long, Disinvestment has been used as a way to fill the gap between revenue and expenditure of the government. While not surprising, over a period of time, the government would have lost its asset while at the same time the money wouldn’t have created anything worthwhile. As much as we would like to think Private Sector is the cure for all that ails, that isn’t the case with the private sector least interested in areas where the margin of profit is negligible or not even available. In these areas that the government can make more sense being present than running everything from antiquated telephone companies to petrol pumps when private sector has shown much more resolve and been able to execute better. Going ahead, we should expect substantial increase in Disinvestment through ETF’s where the government is able to sell a substantial quantity without losing control of the companies. The idea is to stuff shares into an ETF that is then purchased as a basket of stocks. The government sells shares to the ETF, which then sells units to the public to pay for those shares. The Bharat Stage 22 ETF (run by ICICI Prudential Mutual Fund) was one such vehicle – and more shares could be introduced there, or a new ETF set up. We feel that the ETF management will probably vote in favour of the government, the drop in government ownership will still allow them to retain as much control. This would be the ideal method for selling equity in Public Sector Banks since with there is no probability of any government being able to privatize public sector banks. The disinvestment of Air India should go through too and will set a precedent in terms of governments ability to sell off assets that while seen as important for the Nation are bleeding heavily. Other contenders in this category would be BSNL, MTNL among others. Another strange thing happened this year: ONGC bought the government stake in HPCL for 36000 cr. But ONGC is owned mostly by the government. So the government effectively got paid by its own company for another firm it owns. This is not really disinvestment, and basically creates a data point for the sake of meeting some number. The Budget of 2018-19 has set a target of Rs.80,000 Crore the totality of it being Disinvestment Proceeds with nothing from strategic sales. However the 80,000 cr. reinvestment into public sector banks means that at a net level, there’s no disinvestment. We will get Rs. 80,000 cr. by selling some government companies. We will immediately invest the same amount into public sector banks as new capital, and get shares in return. Net-Net we have not disinvested at all. If the market continues to fall, the appetite for investment will be very limited. The better approach would be to do strategic sales and hand control to a third party. But this will, as usual, take a crisis to push things through – and perhaps it’s better to not wish for one.